Dearly beloved, we are gathered here today to honour five of our own, who have given their earthborn lives to the service of others. They have spent their days providing fun and merriment for the masses, at fifty cents a game, asking nothing in return. The journey from their birth in the heart of Chicago, Illinois, to their final resting place in Myrtle Beach, South Carolina, appeared to be long and arduous one. Their bodies showed signs of extreme abuse and neglect that should not have befallen any one of their kind. Their demise on the grounds of the Family Kingdom Amusement Park Arcade was an unfitting end for these five wounded warriors, who continued to soldier on, long after time has passed them by. Please bow your heads in a moment of silence for these once great amusement devices that shall be permanently laid to rest. For ever and ever. Joking aside, I believe the five pinball machines being operated at the Family Kingdom Amusement Park Arcade at 300 S. Ocean Boulevard in Myrtle Beach, South Carolina, are in the running for the worst kept machines in operation in North America. Pinside and social media are filled with images of unkempt location machines with filthy playfields, maladjusted switches and overall poor pinball hygiene. But games of that nature usually stand alone, or in a group of two, all neglected because they are the lone “token pin” in the arcade, which nobody can be bothered, or has the ability, to fix. 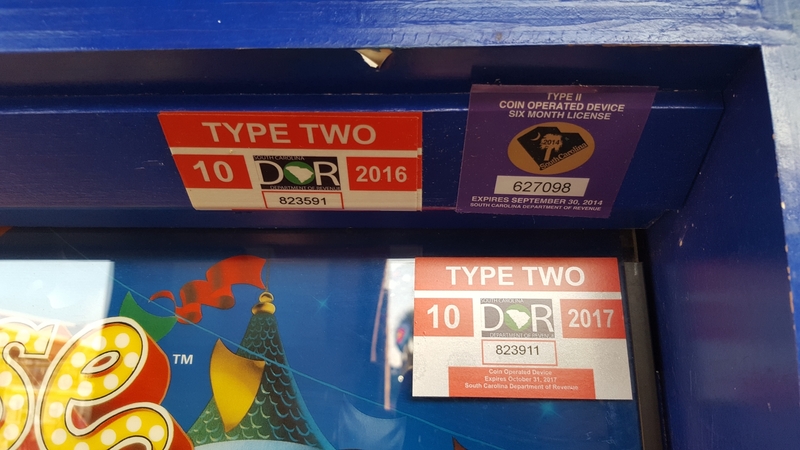 In this instance, we have a collection of five games at a location (a pretty good number by today’s standards), all leftovers from the golden age of pinball and all at least twenty years old. They have been cared for just enough to be kept in daily operation–that is, to accept two quarters for a three ball game. However, as you will see, their condition leaves a lot to be desired. I first encountered these games about four years ago when I first started to take a few weeks during the summer to vacation in Myrtle Beach. Myrtle Beach isn’t my first choice for vacation destinations, but you can’t argue with free accommodation when your mother-in-law isn’t using her vacation home in a secluded area of the city. Being away from my collection, and being a good pinball enthusiast, I compiled a list of places to play on location in Myrtle Beach upon my first arrival. Even with the large number of beachfront arcades in the city, the pinball scene was quite anemic. 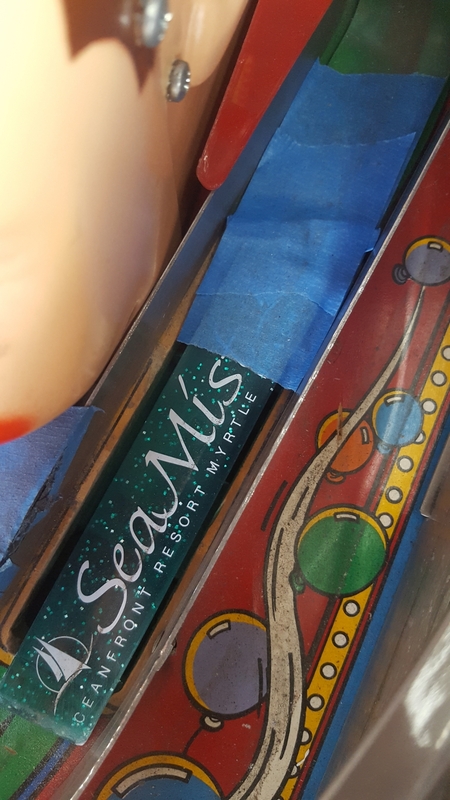 I first encountered the above mentioned games when they were located at the Sea Mist Oceanfront Arcade, a rather sad resort indicative of those located to the east of the main boardwalk. I went in knowing the games would be in poor condition, thanks to the reviews left for the location on Pinside, and sure enough I was met with games that were shells of their former selves. The Earthshaker and Funhouse were virtually unplayable, while actual progress could be made on the Dr. Dude and Jokerz. The Simpsons was in the best condition of the five at the time, but it was turned off–likely, the reason it was in such decent condition. Being eager to know about how these games were still being operated given their sorry states, I asked the sixty-year-old attendant sitting in front of the yellowed and aging stuffed animal redemption gifts at the prize counter, and his curt response told me all I needed to know. I’m sure the games still attracted curious quarters from the patrons, so these golden geese were still being featured prominently near the entrance of the arcade to try to gobble up profits. 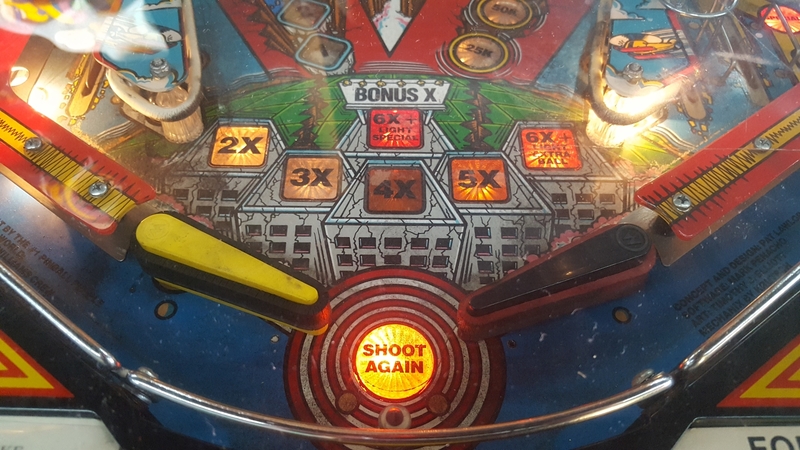 As any pinball enthusiast knows, having games like this on location is a black eye on the reputation of pinball, and may do more harm than good. Customers would probably walk away in disgust having spent their hard earned money on a game that hardly worked or provided any real tactile feedback like pinball games normally would, and the chances of them dropping quarters into location games, if they were to find them in the future, would be slim given this disappointing experience. 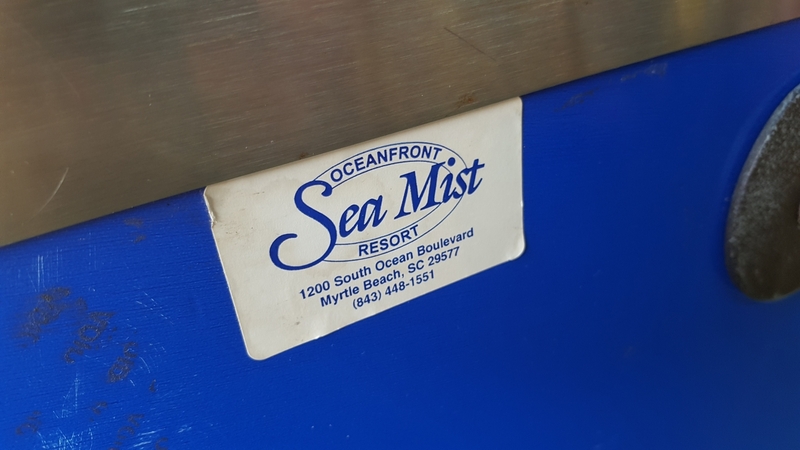 I would check Pinside, from time to time, to see the status of games in the Myrtle Beach area, and before one visit last year, I found that the games had been completely removed from the Sea Mist Arcade. “Finally”, I thought to myself, “They’ve been taken out of service!” But further research of Pinside’s Pinball Map led me to find that this wasn’t the case at all. The five games were part and parcel hauled one mile down Ocean Boulevard to the Family Kingdom Amusement Park where they are still operated today. Sadly, their condition has only worsened over time. But there they sit, at the centre of their new arcade home, still hungry for quarters at fifty cents per play. A screen capture of Pinside’s location page for the Family Kingdom Amusement Park Arcade. The Family Kingdom Amusement Park uses the term “amusement park” loosely. They’ve got rides, concessions, games of skill and an arcade, but it’s more of a second-rate carnival than an amusement park proper. There is no admission charge to enter, with all rides ticketed on a pay-to-ride basis. It appears to be the kind of place that spends more money on billboard and radio advertisements than it does upkeep of their actual property. The grounds are clean, but you find yourself checking your back pocket every so often to make sure your wallet is still there. I grew up in Niagara Falls, Ontario, the Canadian capital of price-gouging family entertainment, so I feel I am justified passing judgment on Family Kingdom here. I had been to Family Kingdom earlier in the year, in March, to visit the games at their new location, out of curiosity more than anything. I wandered onto the grounds at about two o’clock, unaware that the park officially opened at four. There were a few employees milling about, but otherwise, it was a ghost town. It was also mid-week in March, so I thought nothing of it. I located the arcade at the centre of the park, to find the sliding garage-style doors open, the overhead lights on, and all the games powered up and ready to play. 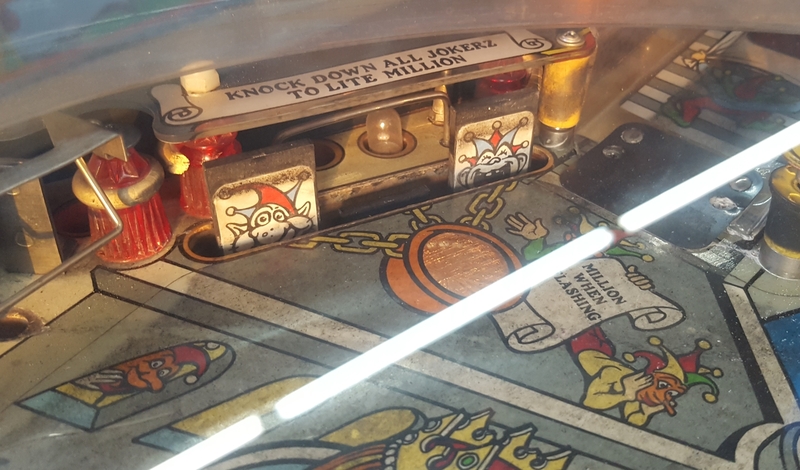 I found the five soldiers of misfortune in their new home, assessed their condition (still very poor) and photographed their serial numbers for documentary purposes at the Internet Pinball Serial Number Database. I made the decision to play, but vowed to not pump too many quarters into the games, thus continuing the vicious cycle of making the machines profitable in such a deplorable state. Over about twenty minutes, I had played a game on each, ending my run on Jokerz. During my first ball, I felt a tap on my shoulder. I cradled up, and looked over my shoulder to find a disheveled (and probably underpaid) security guard of about sixty standing behind me. “Park opens at four. Leave.”, he stated curtly. “Can I finish my game first?”, I asked. I really had nothing to lose by asking. He grumbled, shook his head, and waved his hand begrudgingly allowing me to finish up, standing uncomfortably close to me until my last ball drained. I thanked him–why, I don’t know–and headed for the exit. 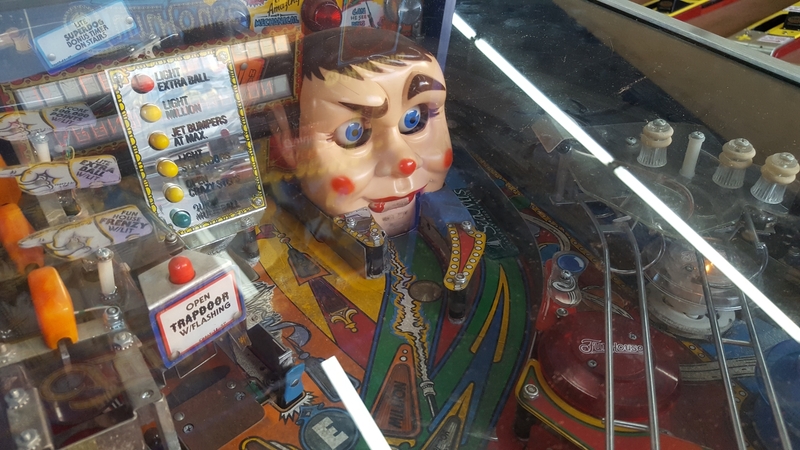 He followed me for about fifty feet to make sure I actually did leave and didn’t make a U-turn and sneak back in to play the poorly cared for pinball machines he was paid to keep a close eye on. The front entrance of the arcade pavilion. I returned to the Family Kingdom Amusement Park yesterday, during the prescribed operating hours this time (4pm to Midnight), to check in on Dr. Dude, Rudy and the rest of the gang. I knew no miracles had occurred, but I wanted to accurately document these location games once and for all before vowing never to return. I entered the park through the front gates, walked past the ticket booths and the sewer pumping station which greeted my arrival. The station was emitting a rather pungent smell of raw sewage on this particularly humid Myrtle Beach evening, and provided just the right atmosphere for the visit. The park contained many patrons on this evening, but many of the rides sat motionless and carnival games empty, in spite of the unenthused barkers dryly urging people to step up and fork over money. Ah, exactly what I want to see and smell when I enter a family friendly amusement park. In the arcade, the games sat where I had found them months earlier. And I didn’t have to spend much money on this visit. I found three games with credits on them, with Funhouse having three credits on it alone. Either the games are set fairly liberal with their free games (unlikely), or people are getting fed up with the condition of the games and walking away after one game (more likely). The Simpsons and Earthshaker sat side by side in the middle of the arcade, while the Jokerz, Dr. Dude and Funhouse were lined up at the rear entrance of the arcade, positioned where the sun’s rays and intense heat beat down upon them. While playing these games, the afternoon sun beat down upon my back, and was almost unbearable—I can just imagine what’s going on underneath the glass and inside the cabinet. In my following description of the games I will only highlight the extremes–I won’t be mentioning the excessive playfield wear, the caked-on playfield dirt, the salt-corroded metal apparatuses, burnt out lightbulbs, missing display segments, misadjusted and weak flippers, mismatched flipper bats, broken plastics, badly warped playfields, or sun-faded artwork. Because every game displayed these symptoms. 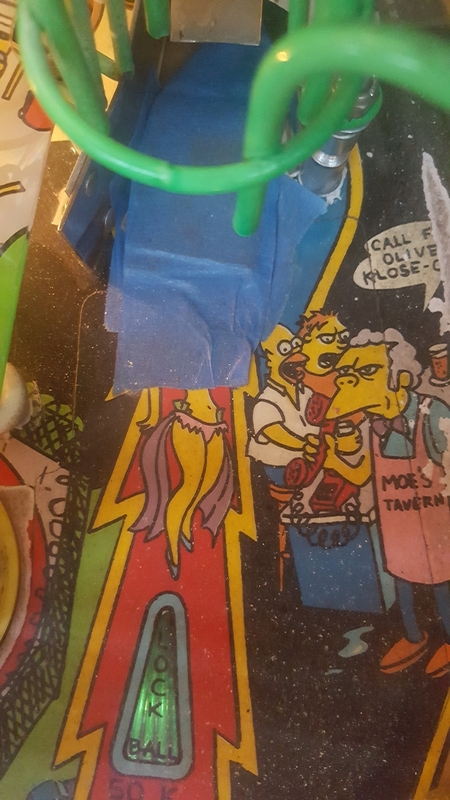 Have you seen how the playfield rubber looks when you first open up a game that has been sitting in someone’s garage for thirty years? The kind that’s cracked, has no bounce and has permanently taken the shape it has been stretched into? Yeah, these games had that kind of rubber. On the Jokerz, the rubbers had completely rotted away, leaving behind only crusty remnants in the groove of the plastic post. And they didn’t bother to replace the rubber after it had rotted away. The Dr. Dude was completely out of commission, in a constant “TILT TILT” state, and its coin entrance housing was taped off with blue masking tape. It was mercifully out of order. When I played the Dude on my previous encounters, the Mixmaster was operational, and multi-ball was actually achievable. I even registered a high score on it a few years back thanks to a “Super Dude” jackpot that had been built up for me to collect. I’m sure the high score is long gone because I doubt the MPU has seen batteries for a decade to be able to save high scores. The lower stand-up targets for the Heart of Rock n’ Roll and Big Shot were now mashed and bent so far back into their under-plastic spaces, it looked as if they wouldn’t be able to register hits anymore. The Big Shot himself was merely legs and a pelvis, missing everything above the waist. 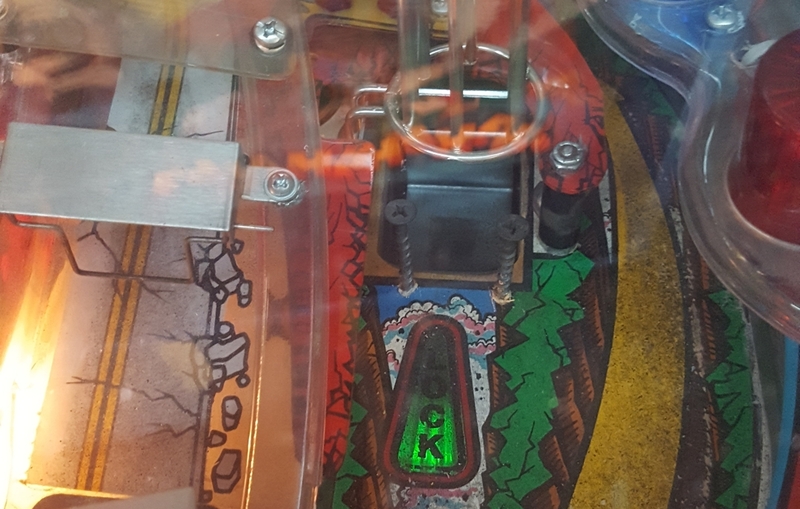 The Earthshaker was a special treat, as it had drywall screws driven into the playfield, in front of the right up-kicker lock. Who needs to replace a bad coil, switch or driving transistor when two drywall screws will do the job just as well. And plenty cheaper, too. 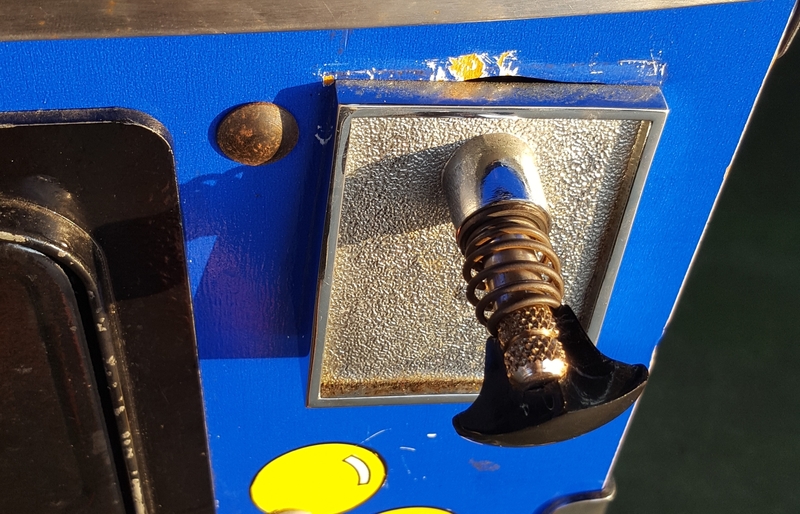 There were a few other black screws strewn about the playfield, apparently in places where ball hang-ups were causing problems for the operator. The Jokerz! played passibly on previous visits (as decent as the game can play, I find it to be one of the worst, if not worst, games of the System 11 era) but the four years since I first played it had taken its toll. I think it’s a given that the backbox animation didn’t work, and I didn’t expect it to. I didn’t expect the centre ramp to lift, but it did and awarded multi-ball when two balls were locked. 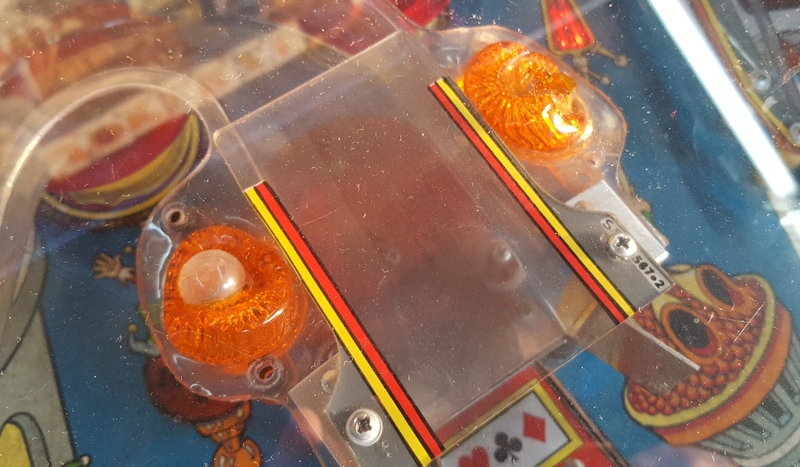 Deformed flasher caps, from locked-on flashers melting them from below, stood at the centre of the playfield as a telltale sign of neglect. 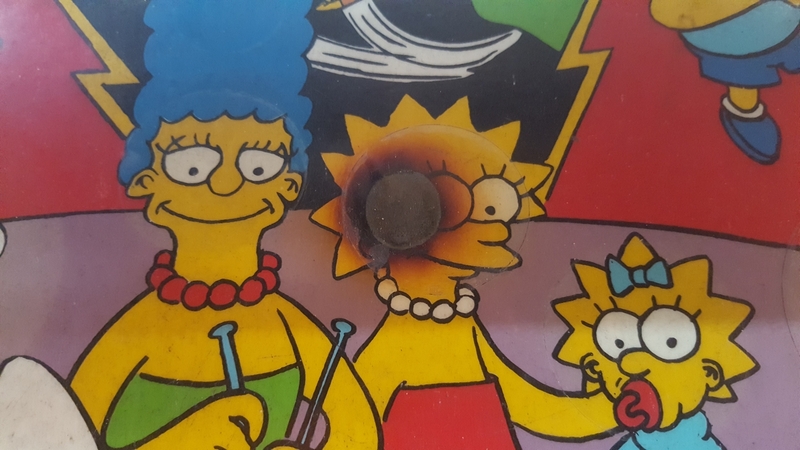 The Data East Simpsons had suffered from locked on flashers, as well, from the telltale burn marks on the playfield. 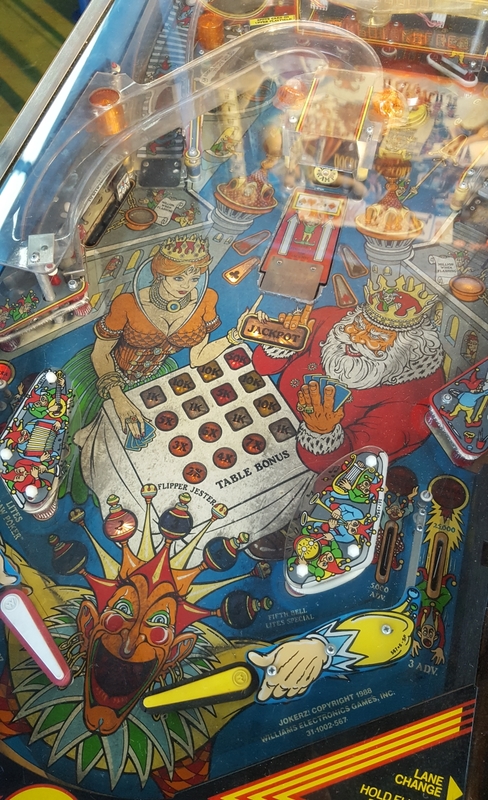 The game also displayed an instance of creatively blocking off a malfunctioning up-kicker: the Princess Kashmir kicker in the back right corner of the playfield. They must have been short on drywall screws that day, because they instead used blue painter’s tape–the same kind they used to tape off Dr. Dude’s coin slots. This mod kind of gets a pass: the blue hue of the tape matches the overall colour scheme of the game. Finally, we have poor Funhouse. The good news was, Rudy partially worked. His jaw was fully operational. Yet his eyes just stared off into the distance, over the player’s right shoulder, as if to wryly contemplate how he deserved such a horrible lot in life. The cabinet was decorated with stickers of Rudy’s past home at the Sea Mist Resort and the backbox frame displayed the City of Myrtle Beach permit stickers from years past (including the current 2017 license). It almost reminded me of one of those worn old-tyme suitcases with the stickers from major cities stuck all over them. The shooter rod had been broken, leaving some sharp edges for a child to run into–exactly the kind of liability you want in an arcade. My favorite modification of the whole lineup was to be found here: a Sea Mist branded length of plastic they used to replace the trap door. It was affixed with, you guessed it, blue painter’s tape. The sparkly green plastic looked to be a piece of a ruler, back scratcher, shoe horn or other cheap trinket given away at the redemption counter of the aging resort. It was a nice throwback to the game’s prior home. It has stood the test of time though–it’s been there since I first played the machine on the grounds of the Sea Mist arcade. Unfortunately, the trap door doesn’t work. It would have been great if it did. These games obviously serve a purpose at the Family Kingdom Amusement Park arcade just as they did at the Sea Mist before it. They are there to maintain the illusion of an “arcade”, as there really isn’t much else in the place to entertain. They are games that take money, serve up three balls, and then display “GAME OVER” once the last ball has drained. For all intents and purposes, these games do “work”, however poorly. If something breaks or malfunctions, put some tape on it and keep it in circulation. If you can’t tape it up, drill some screws in it. Keep taking those quarters from unsuspecting patrons by any means necessary, and empty the coin box at the end of the day. I should mention, however, that during my half-dozen visits to the five games, not once did I see anyone else drop money into them, so maybe my assessment here isn’t entirely correct. 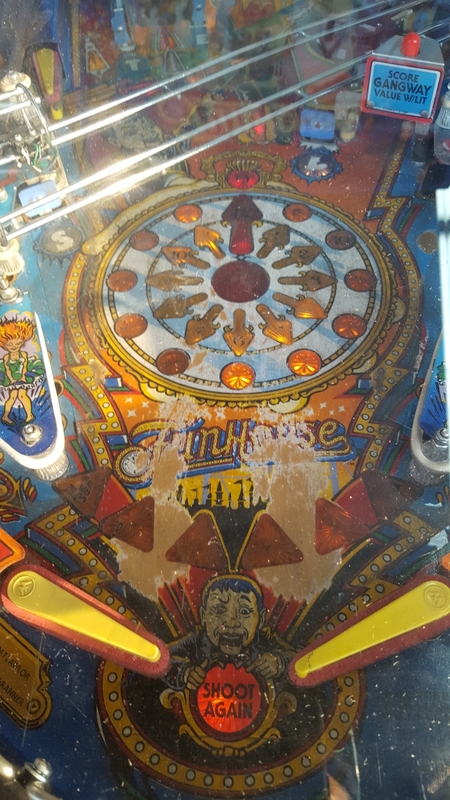 In my opinion, no pinball machine is beyond saving through extensive restoration, but these games are probably pretty close to parts machines, if not dumpster fodder. Ridden hard and put away wet, as the saying goes. I hasten to use the term “Redneck Ingenuity” to describe the upkeep of these games, but perhaps “Ingenuity Without the Aid of Proper Tools, Funding or Compassion” would be a better phrase to describe what’s going on here. 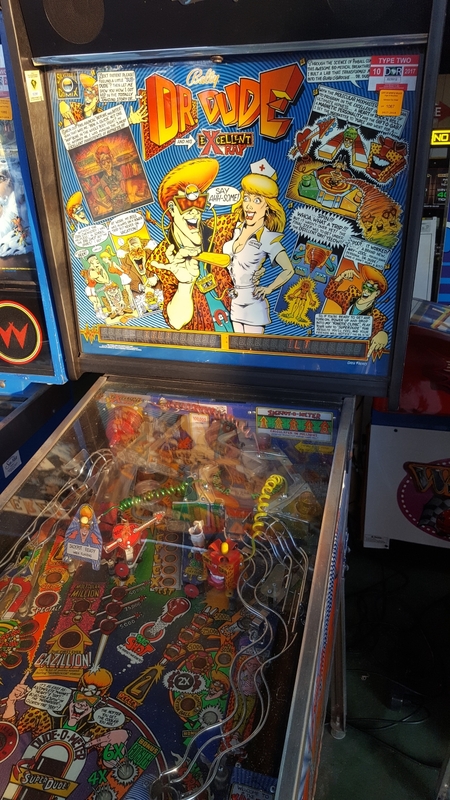 Even though these games are listed on the Pinside Pinball Map, concerned Pinsiders have voiced their warnings about their condition, urging people to stay away. Hopefully the advice is heeded by enthusiasts visiting the area. My frequent visits have been out of morbid curiosity, kind of like slowing down on the freeway to take a look at a messy car crash. That said, there isn’t much in the way of pinball alternatives. The arcade at Black Pearl Mini Golf in North Myrtle Beach is the home to five “pre-Stern” games in good overall condition, and there’s a rumored Myrtle Beach Pinball Museum moving forward in the fall of 2017, but beyond a few games sparsely peppered here and there at restaurants and bars, it’s pretty barren. Perhaps it is time to ask my Mother-in-law to set up a few games at her place to scratch my pinball itch. In any event, this will be my very last visit to the five forlorn games that have died on the grounds of the Family Kingdom Amusement Park. May they forever rest in peace. 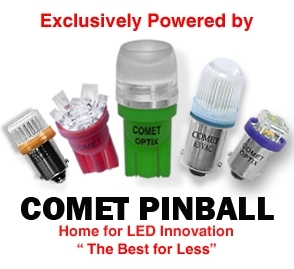 Categories: Feature | Tags: Data East Simpsons, Dr. Dude, Earthshaker, Funhouse, Jokerz, Location Pinball, Myrtle Beach, Myrtle Beach Pinball Museum, Pinball Horror Stories, Pinside | Permalink.